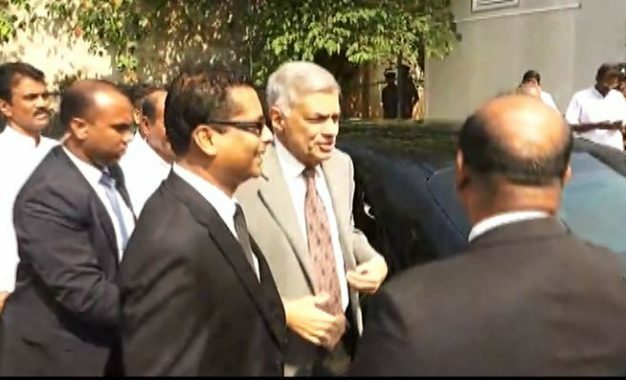 Prime Minister Ranil Wickremesinghe was asked no question of consequence by the commissioners or the Attorney General during testimony today at the Presidential Commission of Inquiry and instead was given a platform to explain the need at the time to raise money. He was questioned on a questionnaire by the Attorney General who failed to ask Wickremesinghe a single follow up question regarding the conflict of interest between Arjun Mahendran’s and Arjun Aloysius’ dealings. During the questioning he said that he wanted Arjun Aloysius to divest his ownings in PTL when Mahendran was taking over. He also said he went by Arjun Mahendran’s assurance that Aloysius had done so. No follow up question was asked regarding what transpired at the commission proceedings during the last eight months. The questions lasted 40 minutes after which Wickremesinghe left for parliament. Almost all UNP cabinet ministers were present at today’s hearings. Minister Fowzie To Be Remanded Next? « ව්‍යවස්ථා දෙකක් පිළිබද කතාන්තරයක් – ජනමත විචාරණය ජය ගත හැක්කේ කෙසේද?